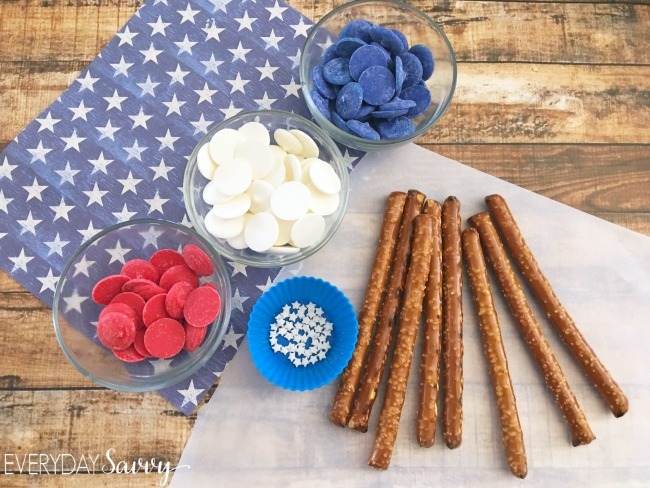 4 Fun Desserts You Can Make This Memorial Day! Please indicate below the emails to which you want to send this article: 4 Fun Desserts You Can Make This Memorial Day! Memorial Day is right around the corner and summer is almost here! To celebrate, we’ve rounded up some of our favorite summery treats. Check out these super easy (and super fun!) desserts you can make this Memorial Day Weekend. If you are melting the candy melts in a bowl, scoop the melted chocolate into a plastic bag, snip a corner of the bag. 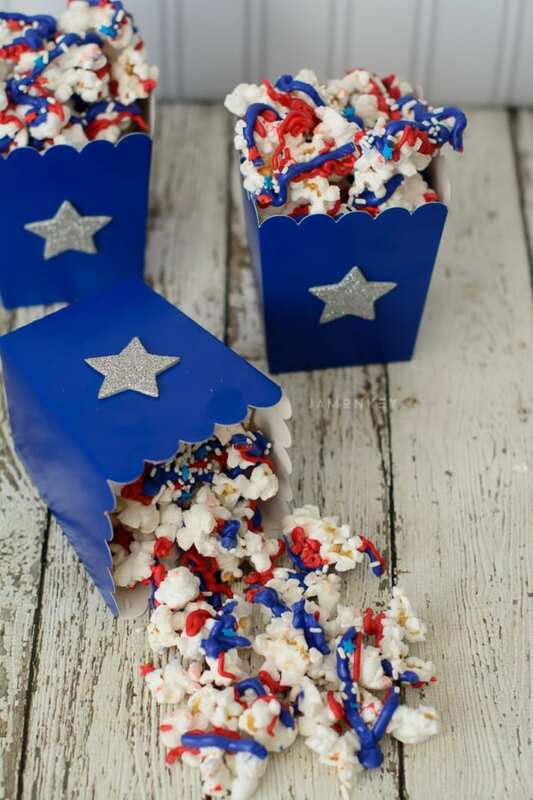 Squeeze red chocolate evenly over popcorn, repeat the above steps with the blue chocolate. If you are adding sprinkles, add them now before the chocolate hardens. Break into pieces and serve in festive popcorn bowls. Place oreo cookies into a resealable plastic bag, seal, and gently hit with a rolling pin to break cookies into pieces. Set aside. Line an 11×15″ jelly roll pan (or regular 9×13″ pan), with aluminum foil and spray very lightly with cooking spray. Set aside. Place a small saucepan with about 1 inch of water on the stove and heat on LOW until barely simmering. Pour bright white candy melts in a large glass bowl (that fits inside the saucepan so that the bottom of the bowl does not touch the water). Place bowl over the top of the saucepan, creating a double boiler. Use a rubber spatula to stir candy melts until melted and smooth. Do not allow any liquid to come in contact with the candy melts. Pour red candy melts in a small microwaveable bowl, and pour blue candy melts in another microwaveable bowl. Microwave the blue candy melts at 70% power, in 30-45 second intervals, until most of the way melted. Remove from microwave and stir to let the residual heat melt the remaining bits. Repeat process with the red candy melts. Pour melted white candy melts into jelly roll pan and use rubber spatula to smooth into an even layer. Alternate drizzling melted red candy melts and blue candy melts in vertical lines over the surface of the melted white candy melts. Using a small wooden skewer or butter knife, swirl in a figure eight pattern to swirl the red and blue into the white. Repeat over the entire pan. You’re not looking for a pattern here, just pretty swirls. 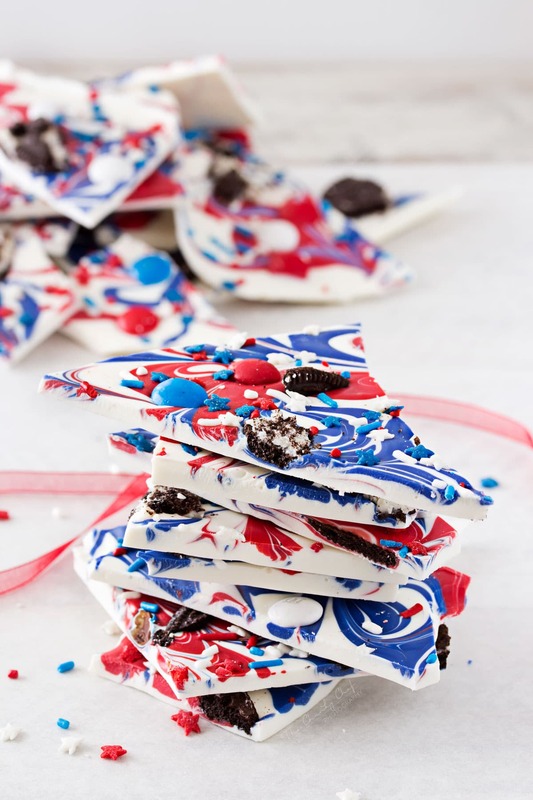 Sprinkle swirled candy melts with oreo pieces, M&M’s, star sprinkles and jimmies. Refrigerate for 1-2 hours, or until hardened. Lift edges of aluminum foil to remove bark from pan, and separate the bark from the foil. Beat together butter and sugar using an electric mixer until combined. Add cake mix, flour, salt, and vanilla and mix thoroughly. Add 3–4 tbsp. of milk if needed to make a dough consistency. Mix in sprinkles by hand. Roll dough into one-inch balls and place on parchment or wax paper on a cookie sheet. Chill balls in the refrigerator for 15 minutes to firm up. While dough balls are chilling, melt almond bark in the microwave in 30 second intervals until melted. Stir between intervals. Using a popsicle stick, dip truffles into melted almond bark and gently twirl around to remove excess coating. Place truffle back on cookie sheet and top with sprinkles. Repeat with remaining balls until finished. Chill truffles in the refrigerator until ready to serve. What tasty treats will you be serving up this Memorial Day weekend? Share your best recipes with us on Facebook, Twitter, and Instagram, using the hashtag #SmileyChefs! We can’t wait to see what you post!